On Friday, August 19, 2017, the first in a series of Workshops and Community Meetings, supported by a grant from the National Academy of Sciences (NAS) www.nasonline.org to the Public Laboratory for Open Technology and Science (Public Lab) http://www.publiclab.org was convened at the Docville Farm, a facility owned and operated by the Meraux Foundation http://merauxfoundation.org , in Violet, Louisiana, within St. Bernard Parish. Over the next eighteen months, additional workshops and community meetings, supported by the NAS grant, will be held in designated municipalities that have experienced environmental challenges in New Orleans, LA; Biloxi, MS; Mobile, AL and Pensacola, FL. Learn about low cost, open source accessible mapping techniques using balloons, kites and digital cameras. Map the St. Bernard Wetland Assimilation Project, collecting 500-1500 regular aerial images and in near infrared photography images. Create between 1-5 maps of the site from the images captured using Public Lab's open source Mapknitter software https://mapknitter.org/ . St. Bernard Parish's Jake Groby provided a detailed description of the project and its importance for wetland sustainability. The participants then filled the large balloons with helium, attached the auto-timed cameras and launched two balloons on opposite sides of the study area. 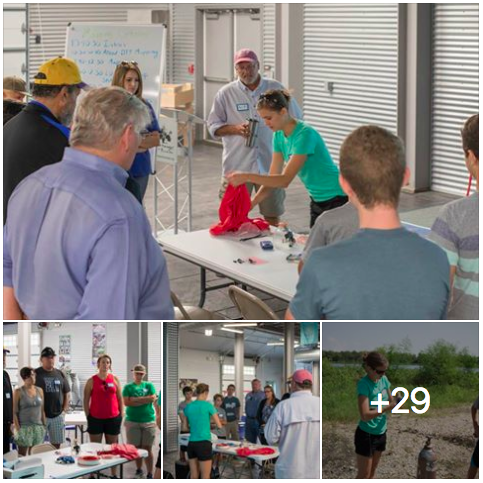 Others engaged included Public Lab's Stevie Lewis and Gilbert Rochon and the Gulf Restoration Network's Coastal Wetland Specialist, Scott Eustis. Public Lab wishes to express its appreciation to all the participants for their enthusiastic engagement, to the National Academy of Sciences www.nasonline.org for support of this and subsequent workshops and community meetings along the Gulf of Mexico coast, to the Meraux Foundation for use of Docville Farm http://merauxfoundation.org , to the Gulf Restoration Network www.healthygulf.org , to St. Bernard Parish Government www.sbpg.net for access to the Wetlands Assimilation Project site, to Jerry Graves Jr. and to Louisiana's Coastal Protection and Restoration Authority (CPRA) www.coastal.la.gov . Further inquiries may be directed to Stevie Lewis stevie@publiclab.org or to Gilbert Rochon gilbert@publiclab.org .